In the minds of many, there was an unshakable stereotype that DIY presents are usually made by children or by those who don’t have the finances to get something really worthy. But this is absolutely not so nowadays. No matter how many variants of gifts stores have, only those that are made with your own hands carry warmth, attention, and care. After all, in them, a giver invests soul, spends the time and creates an exclusive thing, which hardly anyone will have. To understand that DIY gifts are not the thing of the last century, we offer you an interesting selection of presents that you can create on your own. The list of Christmas DIY gifts can be continued until the fantasy ends. But the most important thing in this is to give a present with the soul. At Christmas, it is customary to give cute gifts. They don’t have to be expensive but simply must evoke positive emotions. Definitely, it is easy to choose a themed souvenir or a cool little thing in some online store. But if you want to show your loved one how kindly you feel about her, consider the options of Christmas handmade presents that will please and surprise your girlfriend. If you don’t know what to make, then choose options among our cool DIY Christmas presents ideas. Christmas wreath. What can be better than a beautiful wreath of natural material? This is one of the most creative DIY Christmas gifts that looks great, smells incredibly, and create a very festive mood. You just need to make efforts and create this very beautiful Christmas present for your loved one. Christmas balls with live plants. It is a good option to make a small winter garden at home that will purify the air and please the soul, especially if a girl likes nature. Make decorations with natural elements in a ball and hang it up on a Christmas tree. Angel figurine. You can make a cute angel from any materials. Made with love and thoughts of loved ones, it should serve as a decoration for the house and a talisman, the embodiment of the Guardian Angel. For someone, it can be considered as one of the best DIY Christmas gifts. It is really cute! Postcard. This is the most popular and inexpensive way to congratulate loved ones on Christmas. These gifts are often disregarded. But a postcard made with your own hands and personally for a loved person will always be greatly appreciated. For Christmas postcards, any thematic things are appropriate: angels, snowflakes, biblical characters, and so on. Festive box. 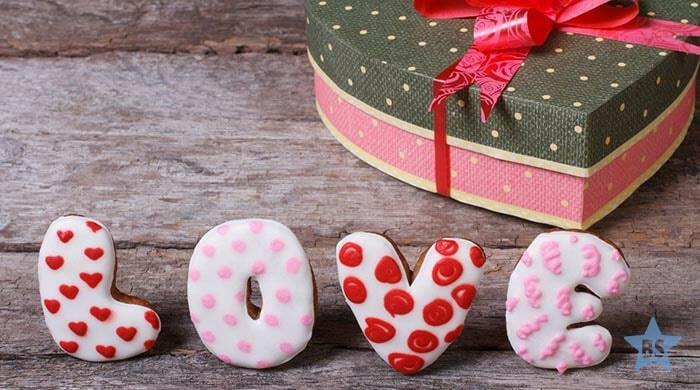 It is a good idea to collect everything that a particular person loves in one box! 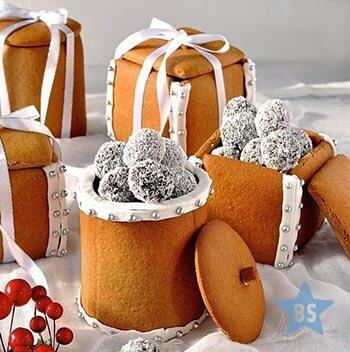 Try to make so that not only some chocolate bar or wine forms your present. Add also a postcard, trifles for the interior and, possibly, a scarf or gloves. Christmas candles. Presenting such easy DIY Christmas gifts, you can be sure that your loved one will be pleased. Approach the process creatively: the easiest way is to tie the purchased candles with ribbons and lace, additionally decorating them with mini-cards or fir branches. Gingerbread. You can make an appetizing gingerbread for your soul mate - just mix different spices in your dough. Famous chefs make them of different shapes and colors. Do the same! Choose your favorite recipe from the wide variety! Set for mulled wine. The recipes for mulled wine can be different. Instead of making it, you can give your loved one the composition of ingredients in a jar for Christmas. Usually, such a gift is accompanied by a bottle of good wine for making a drink. The container with the gift should be tightly plugged so that the spices don’t lose flavor during storage. DIY gifts for her can be edible or it can be a decoration for an interior. It can be just ridiculous, cause pleasant emotions or even bring benefits... It doesn’t matter what you are going to give your loved one – try to do everything with soul. Then a girl will definitely be delighted! Soap hearts. Probably your girlfriend just adores all these “cute female things” like various scrubs, creams, body lotions with which she makes herself even more beautiful and more attractive? Then you should please her with an exclusive and original DIY present: a fragrant and delicate body scrub in the form of soap hearts that can be made with your own hands. Wooden rose. If your girlfriend loves flowers, but you don’t often give them to her because of their high cost and fragility, make her a nice and original surprise – present as a gift an inaudible and always beautiful rose that is made with your own hands. Of course, the work on its production is quite complicated. But believe me, it’s worth it. Photo album. Nowadays we rarely print photos. They are stored on the computer. But how nice it is to print your favorite moments and recall them. Therefore, a beautiful photo album, made with your own hands is a must-have thing. You can look at them together in the evening. It will be even better and more memorable if you put the best photos into the album and come up with a signature for them, instead of making an ordinary photo album. Bouquet of sweets. What do girls like? Flowers and candies, of course! So why not combine these two gifts into one? Try to make a nice bunch of sweets. Any item can be the basis of the bouquet to which candy can be attached. Depending on the color of the sweets, your bouquet can imitate violets, roses, cornflowers, etc. 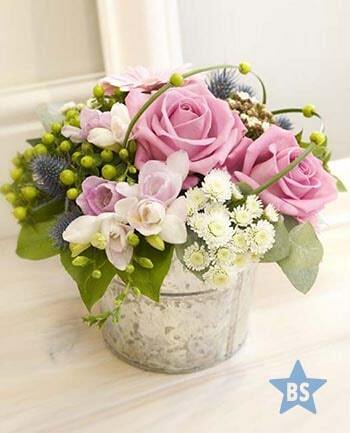 Put a pretty flower pot under the “bouquet” and now you have your indoor flower ready. Tie it with a ribbon and you can present the bouquet to your girlfriend. Isn’t it one of the easy DIY gifts? 100 words of love. Any girl wouldn’t mind hearing a compliment and pleasant words in her address once again. On sheets of paper, write qualities for which you love a girl. Roll these sheets up and place them in a jar. From above, the jar can be signed: “That’s why I love you!” If such DIY gifts for your girlfriend don’t seem serious enough to you, you can put something more substantial in a jar, for example, some handmade accessories. Let a girl find it after having read all the compliments to the last. Thus, the gift will be received with even greater joy. House decoration. If you want to turn this day into a fairy tale, arrange a surprise for your loved one. You can decorate her house entrance with balls and hang a large congratulatory poster. You can make a cup with her favorite photo or an interesting signature. Or it can be a T-shirt instead of a cup. There is a great idea – paired T-shirts, which show that you are a real couple. Personalized engravings on metal products, glass, and crystal are very stylish and have an interesting look. A girl will surely like a vase, a glass, a cup or a figurine with a touching signature. Time capsule. Surely during a relationship, you have accumulated a lot of little things, reminiscent of a pleasant time with your soul mate. This includes movie tickets, joint photographs, notes or even letters, souvenirs from joint trips, etc. Put all this in a box. Having handed the gift to a girl, you can spend the evening in pleasant memories, and then write a message to yourself in the future, which can also be put in the box. This is one of the best DIY wedding gifts if you still don’t know what to give your future wife. Romantic evening. Think of something unusual, such as dinner on the roof of the house, in the park, in the planetarium, etc. Try to cook something on your own and come up with interesting entertainment. A girl will surely be delighted with such a present. Flower in a block of ice. One rose will be enough. It should be frozen in an ice cube. But you have to give such a gift very quickly until it melts. Topiary. You can decorate it with coffee beans, paper flowers, buttons and everything that fantasy tells you. And if we are talking about the anniversary, then you can put your photos there. DIY last minute gifts Personalized gifts. How often do you look for a last minute gift? Most likely, it happened at least once in your life. In such a force majeure, but a pleasant situation, you shouldn’t be lost because there is nothing difficult in making DIY gifts. And here are some of the best ways to make it easier. Candles. It is an attribute of warmth and comfort, and yet it is romantic and one of the cute DIY gifts for any girl. A beautiful candle is a universal gift that will be appropriate in different forms. It can be also a set of candles. It is easy to make such candles. For decoration, you can use purchased laces. Just grease a candle with glue and wrap it with lace. As soon as everything dries, put a candle in the glass and everything is ready! Photo frame. To make such beauty, you need to purchase the simplest frame-basis. These frames are cheap and you can find them in any store for DIY presents and put decorative items on them. It can be anything: stones, rhinestones, beads, etc. The decorations should be fixed on the frame with glue. Magnet with a photo. This is one of the most original DIY gifts for your girlfriend that may look very nice on the refrigerator or magnetic board. It is very simple to make DIY magnets. Choose the best photos, scan them and print in a smaller version. Next, cut them to the shape of stones and paste the photo to the stones, and then glue on a magnet. Set of tea. This is one of the options for a nice gift for your loved one. It is not a simple set of tea, but with love! You will have to work on creating such a gift, but how nice it will be in the end. You need to carefully remove all labels from the tea bags and put miniature envelopes in their places. In each of them, pre-pack a love message or wish for the whole day. Every time a loved one wants to drink tea, a radiant smile will shine on her face. Vaccine with money. Only the most courageous are not afraid of injections, but it is unlikely that someone will agree to voluntary vaccination. And what if you plan to inject vitamin “$”? No one will refuse from exactly this vaccine. Giving money in this way is a very interesting undertaking that will surely be appreciated. Buy syringes, place dollars there, and type humorous instructions where dosage and side effects will be indicated.